The area of Wigan around Mesnes Park is traditionally known as The Mesnes, after the old manorial demesne land. It was purchased for the Wigan Corporation for £2,000 by the then Mayor, Nathaniel Eckersley, a local mill owner, under the Wigan Rectory Glebe Act of 1871, with provisions for a public park and a Grammar School in the southwest corner. The total area of the land was approximately thirty acres, and responsibility for its development was delegated to a sub-committee of the Council. The Committee organised a competition for the best design in 1877, and received twenty-one entries. The winner was John McClean of Castle Donnington, and included provision for croquet, archery, cricket, bowling, lawn tennis and sailing. 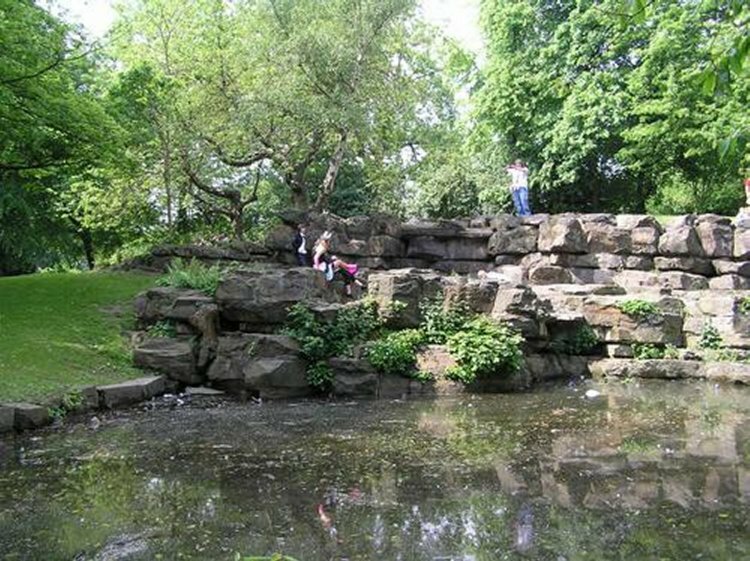 The estimated total cost was £12,000, and the plans provided for the creation of a 1-acre lake, rockery and waterfall, to be constructed by James Pulham and Son. The official opening ceremony was presided over by Nathaniel Eckersley – who, by that time, had been appointed as High Sheriff of Lancashire – on Bank Holiday Monday, 6th August 1878, despite the fact that most of the buildings were still incomplete. The park is now Grade II listed. Fig 2 – ‘The Friends of Mesnes Park’ celebrating the completion of a job well done. 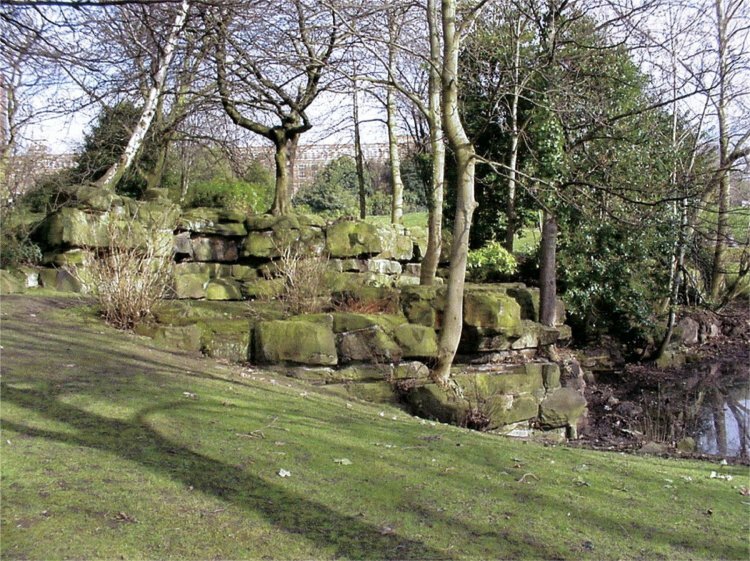 James 2’s waterfall, cascades, rocky bank and chasm were allowed to become completely overgrown, but, over recent years, the Friends of Mesnes Park worked tremendously hard to remove the overgrowth, and clean up the site, and a ‘People and Places Award’ from the British Trust for Conservation Volunteers was used to help with its complete restoration – in fact, I am delighted to be able to say that my confirmation of the work’s provenance in 2000 proved to be a major factor in helping to secure the grant. Fig 1 shows the top of the cascade just after its clearance, and Fig 2 shows a group of ‘Friends’ celebrating its completion. A major award of £6.1 mil in 2010 from the Heritage Lottery Fund – and another from the BIG Lottery Fund – has enabled some major restoration work to transform and regenerate the much-loved Mesnes Park, and part of this work included the restoration of the Pulham cascade, and the installation of a new pump to enable the cascade to flow more freely. Fig 3 shows the cascade in its restored glory today. 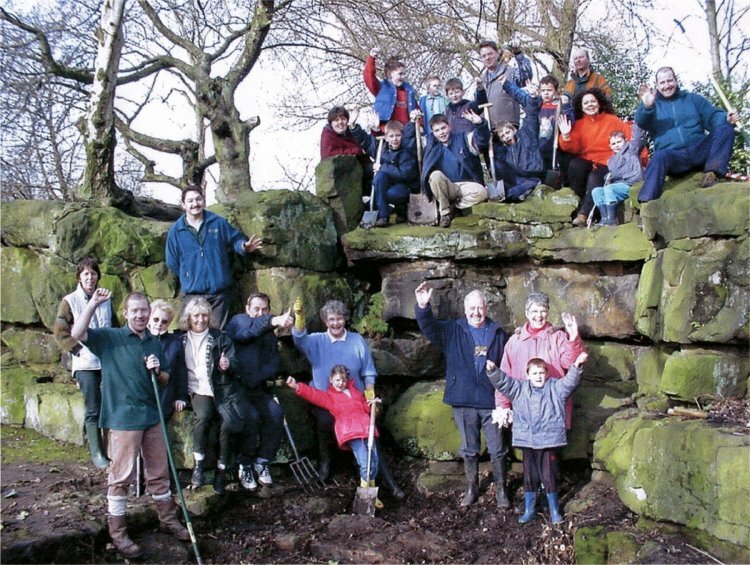 Posted on February 28, 2015 June 4, 2016 by Claude HitchingPosted in Sites Month 2Tagged . . James Pulham and Son, Britih Trust for Conservation Volunteers, cascade, Friends of Mesnes Park, Heritage Lottery Fund, Mesnes Park - Wigan, Nathaniel Eckersley, People and Places Award.